Prodew night covers are designed to keep the cold air inside and the warm air out of refrigerated display cases. Our night covers come with a 5-year warranty, they won't fray, and the handle is the most durable on the market. Prodew night covers will not only help you save money on electricity, but will also serve as covers for restricted item sales, extend shelf life, improve product appearance and freshness, optimize performance and reduce maintenance of chiller cases. Supermarkets, convenience stores, small shops, food courts, hospitals and school cafeterias can utilize night covers to keep their sandwiches, subs, salad stations, deli meat and pastries fresh - and their drinks cold - while saving energy. Prodew also offers security blinds to protect restricted items such as tobacco products and prescription drugs. Our security blinds cannot be cut and have an impenetrable hidden seam along the edges to prevent break-ins. Green, energy-saving products are an important tool in the battle against rising energy prices. Retail businesses have one of the highest rates of electricity consumption, where the greatest amount of energy is consumed by refrigerated systems. 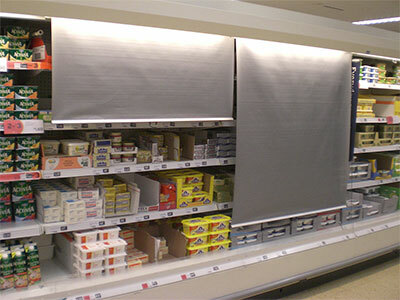 By simply pulling the cover over your open-air refrigerated display cases during non-operating hours, you can realize up to 35% energy savings. One Arizona grocery chain reports saving 112,000 KW per year in each store, which amounts to a savings of $10,000 per year!